Vietnam's most notorious mafia boss has been sentenced to death by firing squad, after a jury in the southern city of Ho Chi Minh found him guilty of murder, bribery and five other crimes. 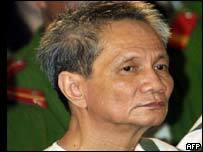 Truong Van Cam - known as Nam Cam - is said to have been in charge of a criminal empire whose influence extended into the highest ranks of the ruling Communist Party. Another 154 people were on trial alongside Nam Cam, including several senior party officials, three of whom have been given jail sentences. Five other defendants have been sentenced to death, and in total, all but a dozen were found guilty of the crimes against them. Nam Cam was described by the court as a dangerous element to society who had bribed state officials to protect a network based on gambling, prostitution, drugs and protection. He stood impassively as his sentence was read out, but his daughter - red-eyed and tearful - said he had been victimised. Nam Cam's lawyer told the BBC he intended to appeal. The court has also announced heavy sentences for some of the senior public figures on trial. The former head of state radio, Tran Mai Hanh, was sentenced to 10 years in jail, and fined more than $8,000, after being convicted of receiving bribes. Former Deputy State Prosecutor Pham Sy Chien, who was convicted on the same charge, received six years in jail and was fined $27,000. Both men have been banned from holding a government job until five years after the end of their prison terms. Former Deputy Police Minister Bui Quoc Huy - the highest-ranking government defendant - was given a four-year jail term for dereliction of duty. Four of Nam Cam's relatives were also given prison sentences, as well as heavy fines. Half Nam Cam's property is to be confiscated by the state and he will additionally have to pay a $150,000 fine. The case is being seen as a test of how serious the Communist leadership is taking its pledge to wipe out the high levels of corruption which plague Vietnam, correspondents say. 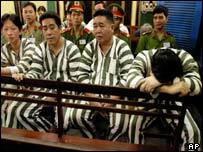 But some who have followed the trial in Ho Chi Minh City remain cynical. "The whole thing is rather farcical," one man told the French agency AFP.